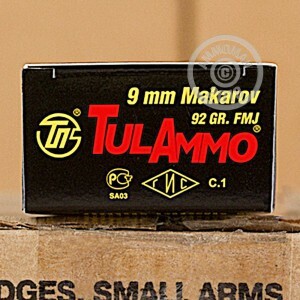 Warm up to your inner Cold War shootist with these 9x18mm rounds from Tula. 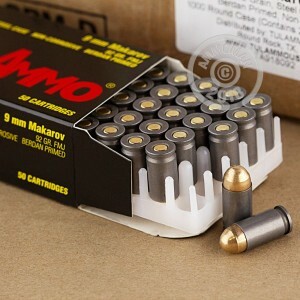 This ammo features full metal jacket (FMJ) bullets that are cleanly rounded for reliable feeding in your favorite C&R handguns like the Makarov PM, Polish P83, and Hungarian RK59. Each bullet weighs in at 92 grains and is on par with classic surplus ammo for soft-recoiling target work and range practice. Tula crimps the projectiles into steel casings which also house dependably burning powder and non-caustic Berdan primers. While the steel casing is not reloadable, its inexpensive material helps to cut costs and pass savings onto you as a shooter, making these 50-round boxes great for casual use as well as for building a personal stash. Since many 9x18mm chambered pistols were engineered with this specific kind of ammunition in mind, shooters need not worry about increased wear of parts or dirty chambers. The Tula Arms plant in Russia has been around for over three centuries during which it has been responsible for producing military supplies and commercial exports during times of conflict and bouts of peace. 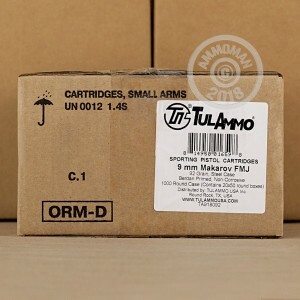 This gives the company vast knowledge of mass production techniques that lower prices without sacrificing quality, resulting in affordable ammo that you can count on to function without fail.